Tag line: "There's A Good Reason Some Talent Remains Undiscovered"
Trivia: Much of the dialogue was ad-libbed. Mayor Glenn Welsch (Larry Miller), the head honcho of Blaine, Missouri, is excited about his town’s upcoming sesquicentennial celebration. Like many citizens in this small Midwestern community, Mayor Welsch believes he lives in the best darn town in the state. A popular saying in those parts is “if you don’t like the weather in Missouri, just wait five minutes and it’ll change”. Well, that's not good enough for Mayor Welsch. He’s convinced that, with some good old-fashioned hard work, Blaine can get that wait down to 3 or 4 minutes, tops! 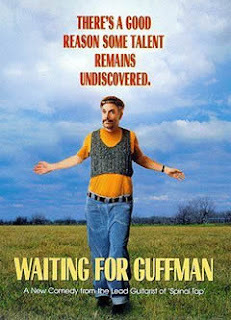 Waiting for Guffman is yet another hilarious ‘mockumentary’ from the creative mind of Christopher Guest, who this time out serves as director, co-writer (with Eugene Levy), and star. Corky St. Clair (Guest) is a transplanted New Yorker who dreams of making it big on Broadway. He agrees to direct a musical play for Blaine’s sesquicentennial celebration, one that will pay tribute to the community’s rich history. To star in this show, Corky taps the husband / wife team of Ron and Sheila Albertson (Fred Willard and Catherine O’Hara), who have a little theatrical experience of their own. Rounding out the cast is Dr. Allen Pearl (Eugene Levy), a dentist, and Libby Mae Brown (Parker Posey), an employee at the local Dairy Queen. Corky works tirelessly to make this play the most memorable production in the history of Blaine, and both he and his cast are thrown into a tizzy when they receive word that a major Broadway talent scout, Mr. Mort Guffman, will be flying in specifically to see the show. With the possibility of stardom staring them in the eye, this tight-knit group sets out to transform their small-town show into a big-time Broadway hit. As with each of Guest’s mockumentaries, Waiting for Guffman boasts several well developed characters, and we come to know each of them quite intimately; from the effeminate Corky St. Clair to funnyman Dr. Pearl, whose frequent Johnny Carson impersonations have been, thus far, the extent of his show-biz 'experience'. Because they're so well fleshed out, we become fully invested in these people; we root for them, smile with them, and even cry a little when things don’t go as they planned. Hell, I even enjoyed that silly show of theirs, mostly because I know how hard they worked to make it a success. Guest has made a career out of exploring characters teetering on the edge of showbiz fame, a fame that always seems just a bit out of reach. In This is Spinal Tap, we watched as aging rockers made a short descent down the ladder of success. With Waiting for Guffman, it’s the exact opposite; a group of people are given hope that they’re on their way to the top. The characters in Waiting for Guffman truly believe fame and fortune are in their future. In fact, now that they’ve conquered Blaine, there’s no telling how far this troupe might go. Hell, they could even make it all the way to Cape Girardeau.